Senior PLO official accuses US of trying to eliminate the "Palestinian issue" by adopting Israeli positions. Erekat accused the US administration of being biased in favor of Israel in its decision to recognize Jerusalem as the capital of Israel, remove the issue of “Palestinian refugees” from the negotiating table, legitimize settlements, not recognize the two-state solution, and to define Palestinian self-defense as "terrorism." He noted the importance of the support of all countries in the implementation of international law and the principle of a two-state solution based on the pre-1967 borders, namely the sovereign state of Palestine with eastern Jerusalem as its capital on the borders of June 4, 1967. 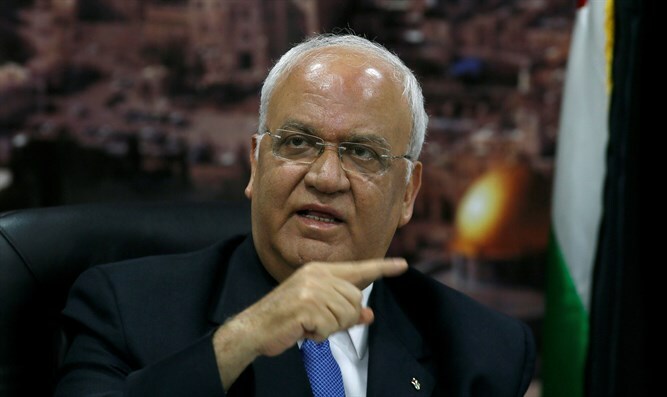 Erekat added that the Palestinian Authority is trying to obtain the support of the European Union, the African countries, the South American countries, China, Russia and other countries for the Palestinian concept of conflict resolution presented by Palestinian Authority (PA) chairman Mahmoud Abbas to the UN Security Council on February 20, 2018. His comments come ahead of this week’s US-led conference in Warsaw, which will deal with Middle East peace, among other issues. White House senior adviser Jared Kushner, who is US President Donald Trump’s son-in-law, will also take part in the conference and provide an update on the Trump administration’s peace plan, which the PA has rejected before it has even been unveiled. Abbas’ peace initiative, which he presented to the Security Council a year ago, calls for an international peace conference and for establishing an international mechanism to sponsor the peace process with Israel.